The state of politics in the world today can seem, at best, murky. It can be difficult to know who to trust or which party really upholds women’s interests. With the government calling on us to vote again on 8th June, we need to make some sense of the chaos and quick. So, where do we start? Last month, Theresa May announced a shock snap election (despite promising to not hold one until 2020), in which she was debatably driven by her parties’ lead over Labour. An election win would enable the Tories to more easily pass their favoured Brexit related legislation. The announcement provoked calls for ‘progressive voting’, with the Green party tactically pulling out of crucial election seats to help Labour topple the Tories. This is in the context of the UK’s unrepresentative first-past-the-post electoral system, where the number of votes cast for a party does not determine the number of seats they will win in parliament. No wonder many of us are suffering from ‘world-whelm’! It’s enough to disaffect us from politics altogether, which is what we saw with the sense of ‘Bregret’ from voters who cast a protest ‘leave’ vote in the EU referendum but regretted it once the economic reality had set in. If there is one thing we have learnt from the UK’s political turmoil, it’s how powerful your vote actually is. As 2018 marks 100 years since women were granted the right to vote and with women’s rights at the forefront of activism today, we must recognise that every vote makes a difference. It is important now more than ever to make the right decision towards gender equality on June 8th. However, whilst a representative proportion of women in parliament may constitute equality this does not necessarily mean that those women will vote in favour (or at all) of women-specific legislation. For example, Theresa May did not vote for equal pay transparency, whereas Jeremy Corbyn voted in favour of this policy. 3. Vote for your local Women’s Equality (WE) party MP. Founded in 2015, WE do not yet have a seat in parliament, but have achieved fledgling success by gaining over 350,000 votes across 4 areas in their 2016 election campaign. There are 7 WE MPs standing in the 2017 election, a party founded on the principles of equality with objectives on ending violence against women and equalizing opportunities, representation and education. Find out more about WE here. Ultimately, how you vote is your choice and there are multiple ways that you can use the upcoming election to vote towards gender equality. Whichever route you think most effective, between tactically toppling the Tories or backing your local female or WE MP, don’t let the bewildering landscape of British politics deter you from having your say, use your vote on June 8th. 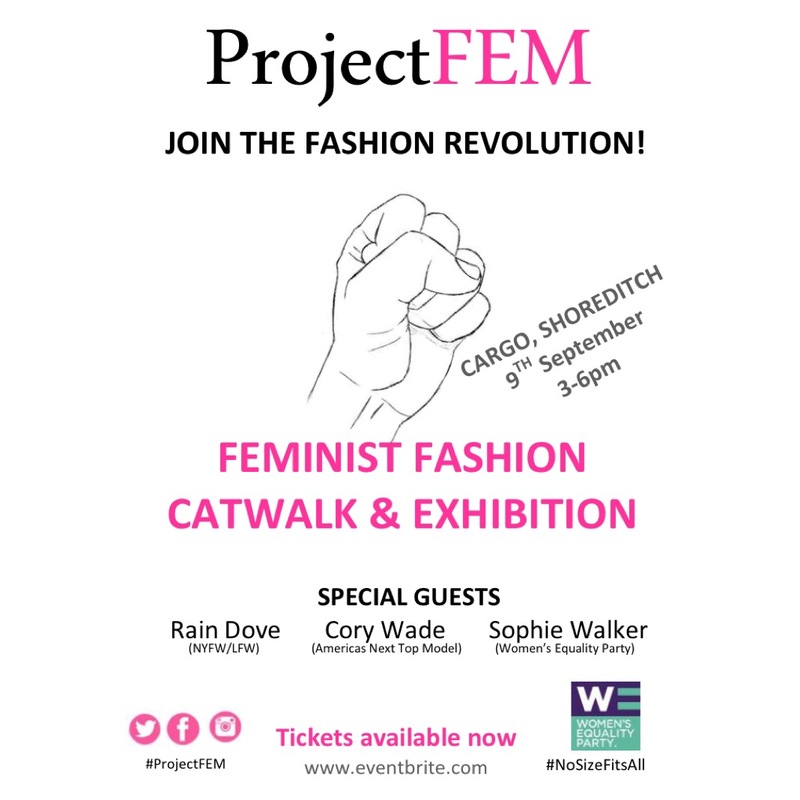 We are hosting our first event under ProjectFEM. Experience a truly empowering and inclusive fashion culture with diverse and representative models and ethically and socially responsible designers. We are working with the Women’s Equality Party’s #NoSizeFitsAll body image campaign to combat the ideals perpetuated by the current fashion industry. Let’s join forces and create the change we NEED to see in the world! What Does Feminism Mean Today?